The final judgment in a divorce case is the document that officially marks the end of the marriage, returning you and your spouse to the status of single individuals. The final judgment, also called a divorce decree or final order of divorce, contains all the terms of the divorce. It includes the division of marital assets and a parenting plan spelling out whom the kids will live with and whether a parent will pay child support, as well as issues such as their education, health care and religious upbringing. However, despite the word "final," the terms of the agreement can be altered later if there is a change of circumstances that warrants an adjustment. Florida law provides two ways to arrive at a final judgment in a divorce. If the parties reach an agreement on all of the issues involved in their divorce, often with the help of a court-ordered mediator, a consent order incorporating the agreement is submitted to the court. Upon court approval, a final judgment is entered. If the parties can't reach an agreement, the judge will decide the disputed issues based upon the evidence presented during trial and enter a final judgment. A judge cannot issue a final judgment until at least 20 days after a divorce petition is filed. Even if there are no issues in dispute, Florida law mandates the delay. However, the court can grant an exception if one party shows that it would be unjust to delay granting a final judgment. Final judgments can be modified by the court if the lives of you and your former spouse change significantly after the divorce. For example, you may have lost your job or had your income cut substantially and need to reduce your alimony payments. Your former spouse marries a billionaire and no longer needs assistance, or your ex want to relocate from Florida to California and take the kids that are in her custody. In these types of situations, the party seeking to modify the final judgment must prove to the court that the change of circumstances warrants changing the terms of the final judgment. When children are involved, a Florida family law court has the authority to order the couple seeking a divorce to go into counseling. 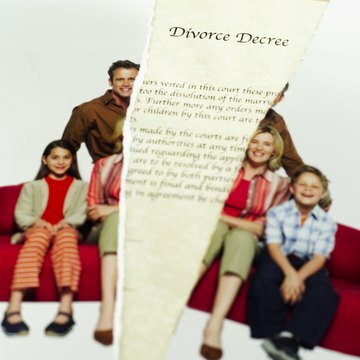 Divorce proceedings can be delayed for up to three months in order to give the couple time to consider reconciliation or come to an agreement concerning the disputed issues. If you can resolve the issues between you and your spouse before you go to trial, you can control the outcome of the divorce and attain the final judgment you want. Otherwise, you leave your fate in the hands of the judge, who must rule strictly based on the evidence presented at trial. Martin Law Firm: What Is a Final Judgment in a Divorce Case? Maryland state law provides its residents with a straightforward process to legally change their names in one of the state circuit courts, provided it doesn’t relate to a marriage or divorce. As long as you familiarize yourself with the Maryland procedures prior to initiating a court case to change your legal name, people will be addressing you by your new name in no time. What Is a Stipulated Divorce Hearing?